Difference in invoice no and amount paid as IGST. Wrong bank account details provided to Customs Department. 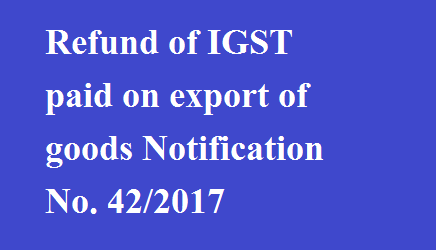 Further, refund of IGST paid on Export of Goods for the month of August, 2017 will be allowed for those exporters who will declare the information related to Zero rated supplies in Table 6A of GSTR 1. GST Council in its 22nd Meeting had approved the IGST Rate of 0.1% for supplies to merchant exporters and Notification No. 41/2017 - Integrated Tax (Rate) dated October 23, 2017 have been issued to give effect to such decision. Similar notifications have also been issued under CGST, UTGST and respective State laws to give effect to the decision of GST Council.